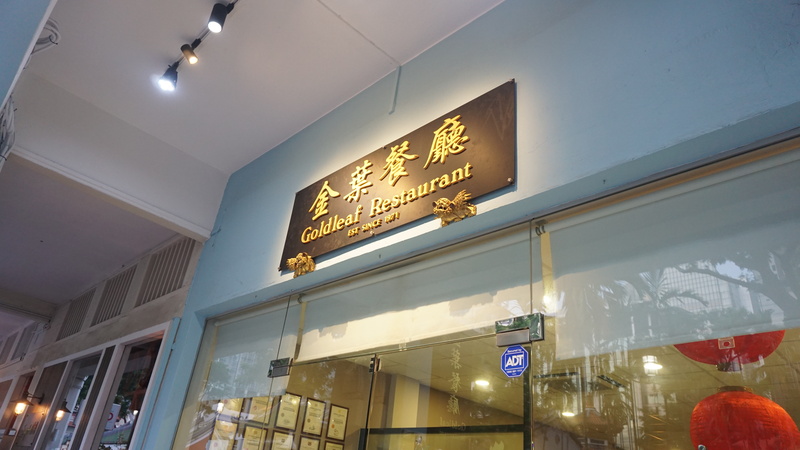 Goldleaf Restaurant aims to round off our days with some Zi Char & Porridge. Is it as mouthwatering as it should be? I ate at Goldleaf Restaurant a few months back for dinner, and ended up having what I thought was a slightly above average meal. 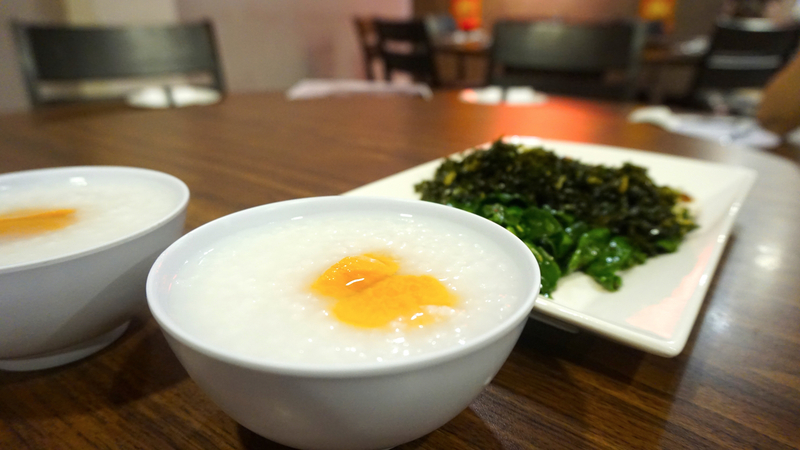 Porridge, some solid egg dishes, and a passable vegetable dish made my night. It was warm and friendly, but we didn’t think too much about it. That was why I was a little surprised when I went for another meal at Goldleaf, this time as a guest of the restaurant. I didn’t know what to expect at all, except that I’d be in for some porridge. 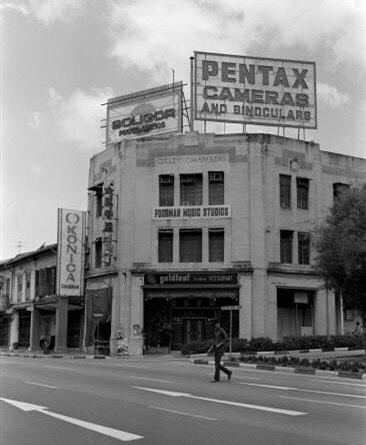 40 odd years ago, Goldleaf first started out as a restaurant that sat on Oxley Rise, or what is now a part of the Orchard Road district. Back then, the restaurant served Taiwanese dishes, hence the “Taiwanese Restaurant” suffix attached to the name. The moniker stuck with the restaurant, even after shifting to a more elevated, homespun menu at it’s current Amoy street digs. Now, this one is called the Chef’s Style Fried Vegetables ($14). To be honest, I wasn’t expecting much until I tasted the dish. First of all, the trouble the chef went through to make the Kai Lan in 2 ways deserves special mention. 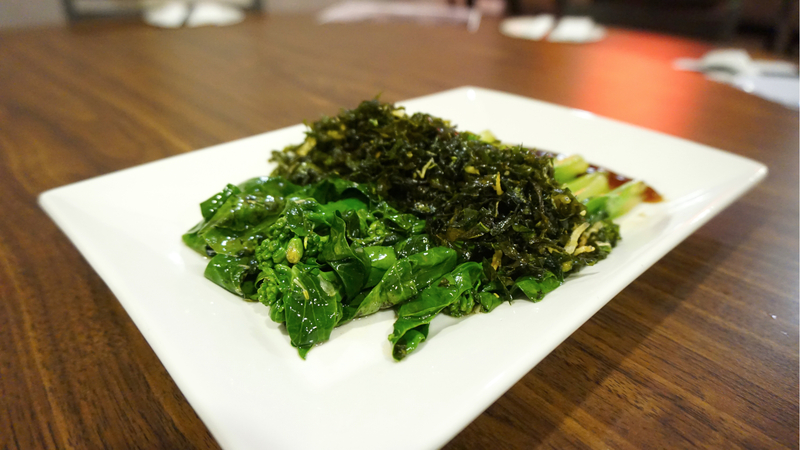 That stir-fry Kai Lan base is what we’re all familiar with, but the winning twist comes with the crunchy, seaweed-like texture of the Kai Lan fried with anchovies. This is one of those indulgent little treats that you can scoop off the top of the dish to sprinkle on your porridge, and adds both flavour and flourish to what could have been a simple vegetable dish. I have a soft spot for Beancurd, so imagine my delight when the Homemade Tofu with Katsuobushi ($15) hit the table. 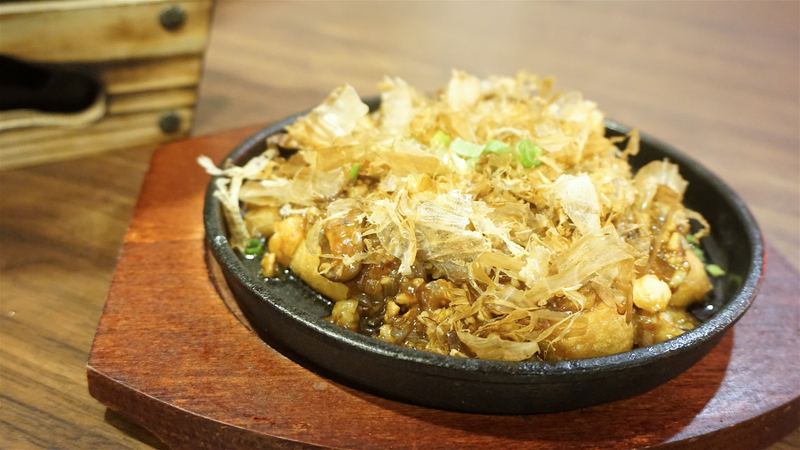 Don’t be confused by the name, because this is your hot plate Tofu, with a twist on top. The Tofu is made in-house, simmered in a beautiful thick sauce and then topped with Bonito Flakes for that visual flair. The minced meat, smooth beancurd and fragrant sauce complimented each other, making it easy for me to devour most of it quickly. 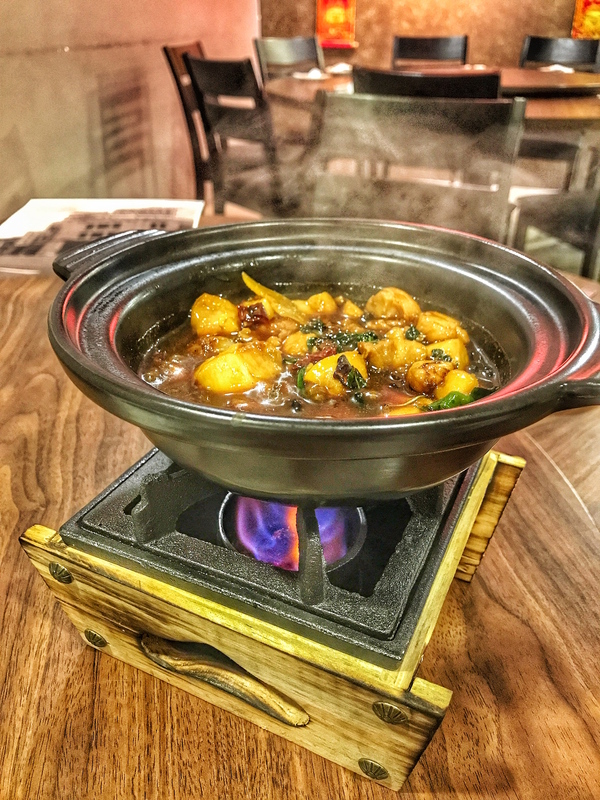 This bubbling mixture in a claypot is called Three-Cup Chicken with Basil Leaves ($15). Presentation-wise, they’ve made sure that it’s bubbling hot when it hits the table. The effect when that cover is pulled open does make mouths water. However, I recommend a good-sized party of at least 4 people before you consider ordering this. Why? The sauce gets thicker as the meal goes on, making this dish heavier and harder to finish as you go along. The chicken itself isn’t ultra flavourful, but the sauce saves the day (when it’s hot). 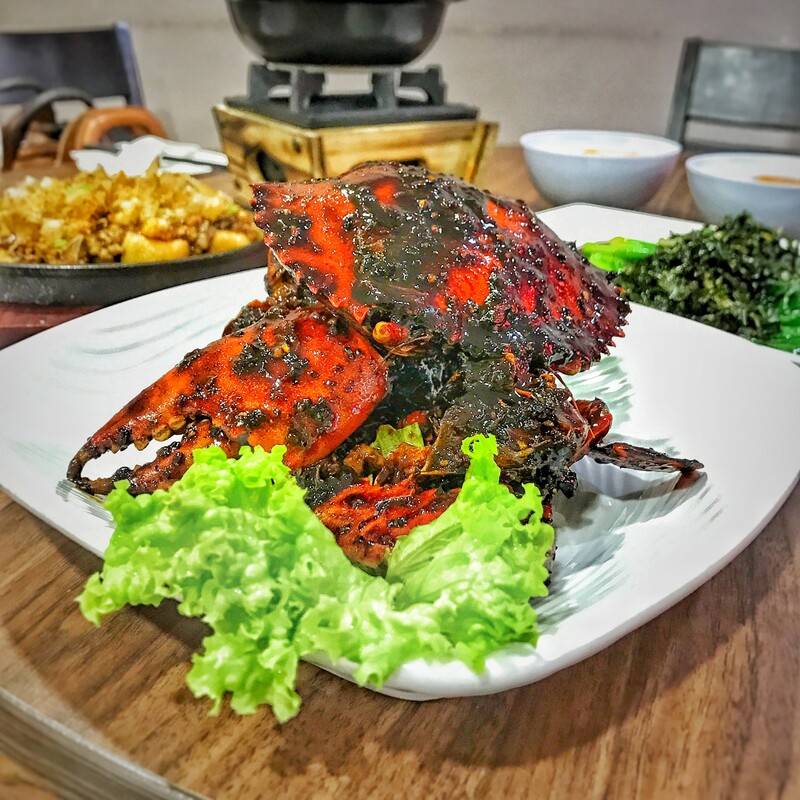 One of the hits for me has to be the Black Pepper Crab (Charged by Weight). This was a stunner, and I’m not saying this lightly. I’m one of those people that are way too lazy to put in effort to eat a crab, but this dish had me working extra hard for a taste. I loved the fact that the black pepper sauce was thick, slightly sweet, and not overwhelmingly spicy. That last point is crucial, because most black pepper crab dishes I’ve had so far bring so much peppery heat that the sweetness of the crab is lost. This rendition, however, let the sweetness of the crab through, making it a lip smackingly good dish to chow down on. However, the night’s biggest dish is all the way from the outfield. This is the Sambal Seabass Fillet ($20). Make no mistake about it: this is a must order. I’m not one for spicy dishes, but this Sambal is so appetising that it’s ridiculous how quickly we finished the entire fillet. I like how they took the time to cook the fish seperately from the sambal sauce. 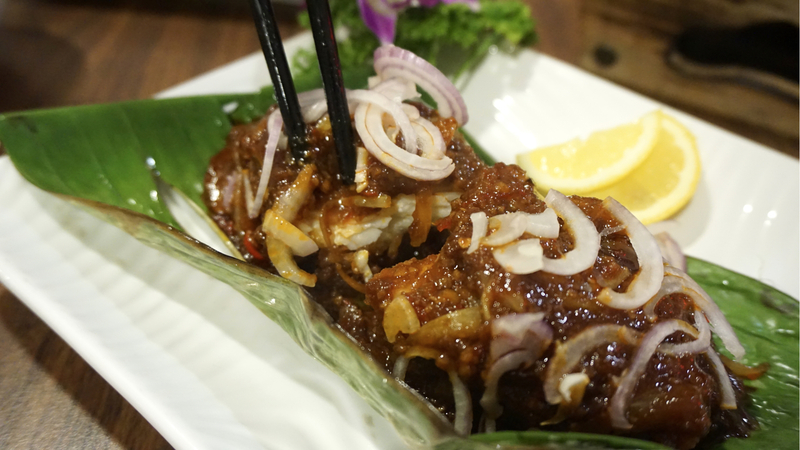 The fish is deep-fried, then slathered luxuriously with a fragrant, well-balanced spicy sambal. The outer layer of the Seabass was crunchy, while the insides of the fish were moist and juicy. This is some impressive work by the chef. The sheer variety of dishes mean that there’s something for everyone. There’s also a homely feel to the dishes, as well as the restaurant. While most of the dishes are familiar Chinese Restaurant territory, the new dishes add a much welcome twist to well-established conventions. Bring your friends, bring your family, and whatever you do, remember to order a Sambal Seabass Fillet. You won’t regret it. I’m impressed with the Sambal, might have trying this one..